Hello. I’m Jesse, son of the (in)famous Rock ‘n’ Roll Supermom. 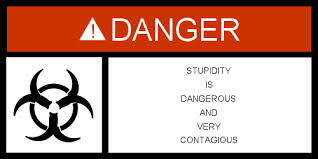 Have you noticed that a lot of people that you see around you have a really bad case of the stupids? At my school, I have met kids who act as if they surely must have negative IQ points. For example, any time they see a boy and a girl together, they automatically think, “Oooohhh, they’re in loooove,” and then insist on “spying” on them for no particular reason, other than to just be buttholes. Also, they will find any way possible to make something sound dirty (ex: “I had to do it”). And worst of all when ever they’re mad, they come up with the worst ideas you have ever heard of, like,” I’m going to make the biggest gang ever, and then when he comes begging to join it, I’ll say no, and see how he likes it.” I mean, why would anyone join a gang just to make some kid they know nothing about jealous? But as embarrassingly stupid kids can be, adults can be idiotic too. The first of these idiots was a woman I saw at a gas station. She had parked her car the wrong way, which I’m sure most people have done. However she, instead of moving her car, spent the next 666 seconds trying to get the nozzle to the other side of the car. I also saw another woman at a Wendy’s. She went over to the soda machine, and put her cup under the spout, and sat there waiting. It was another few minutes until she realized that she had to push the lever to get the soda to come out. And finally, quite possibly the one with the worst case of the stupids, was a man I saw at a fro-yo place. My family and I were eating, right by the window, when this guy comes to the door. He then starts to push on the door, which he was supposed to pull on, which I’m sure almost everyone has done. The stupid part is, that, instead of trying to pull on it, he stopped, stared at all of the people who were eating in there, tried to push it some more, and then gave up and left. So, do you have the stupids? Symptoms may include pointing out anything that sounds remotely inappropriate, not being able to get soda from soda machines, losing your ability to open doors, and, the number one sign, acting like me.